Today in hockey history, a popular line is invented, a crazy streak begins, a former referee has some heroics, Gretzky makes every other player look like a scrub, a defenseman sets a fast record, and a great forward sets a World Juniors record by skating over his opponents’ frozen tears. 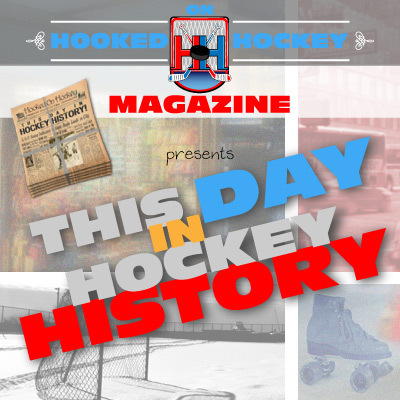 December 30, 1904 – In the first game of a best-of-three Cup challenge game (read the last issue for a little more detail about the “Challenge Cup Era”) between Ottawa HC and the Winnipeg Rowing Club (yes, that was their name), a red line was drawn between each set of goalposts to aid the referee in awarding goals. It was a significant addition, as the goal lines in the net still exist today, and have even been expanded to the boards. December 30, 1934 – The Rangers and Bruins battled to a 0-0 scoreless tie, and it was the first of a 37-game overtime undefeated streak for the Bruins, the longest in NHL history. The streak would span over four years, though it’s slightly less impressive when you consider that they had 27 ties in that period (10-0-27). December 30, 1978 – Frank Udvari, after being elected to the Hall of Fame, came out of retirement to officiate his first game in 12 years, an Islanders 4-2 win over the Atlanta Flames. What was Udvari doing before he stepped in to ref, you ask? Sitting in the stands. Udvari, the 55-year-old Supervisor of Officials, had to replace the injured Dave Newell in the game he was attending as a spectator. The man took his job seriously. December 30, 1981 – Wayne Gretzky scored five goals and added an assist (six points, no big deal) in the Oilers 7-5 win over the Flyers. After 39 games, the five goals gave Gretzky…50 goals. Yes, he scored 50 goals in 39 games, the fastest 50 in 50 in NHL history. He ended up scoring a career-high, NHL record 92 goals that year (in 80 games). That’s…ungodly. December 30, 1983 – As if that last record wasn’t enough: Gretzky picked up an assist in Edmonton’s 2-0 win over Boston to set a new NHL record with a 15-game assist streak. He later extended the mark to 17, which, coincidentally, was tied by teammate Paul Coffey in the 1985-86 season. December 30, 1992 – Washington defenseman Al Iafrate became the first player in NHL history to have his shot officially break 100 miles per hour, as he had one clocked at a then-whopping 101.4 MPH during the Capitals Superskills competition. Impressive, but since then, the record has been set and broken numerous times, and the highest mark currently stands at 108.8 MPH, a Zdeno Chara slapshot in the 2012 NHL All-Star Skills Competition. December 30¸1992 – Peter Forsberg set a World Juniors Championship record with 10 points in a single game…a 20-1 Sweden win over Japan. That’s just cruel, cut the poor guys a break. Japan allowed 83 goals in seven games (while scoring just nine), more than 11 goals against per game. Forsberg ended the tournament with a record 31 points in seven games, more than four points per game. Sweden would claim only second place, though.